as of today, we are thrilled to celebrate our "GOTCHA" day--4 years of living with our human in Connecticut. Before that we were "shelter kitties" But In December 2012 our human, needing furrrballs just like us in her life came to get us! We spent the first night in a luxuriously appointed room with soft rugs & TUNA. By morning we were raring to go explore the rest of the house. Here we are at 1-1/2 years old, on our first morning "jaunt." 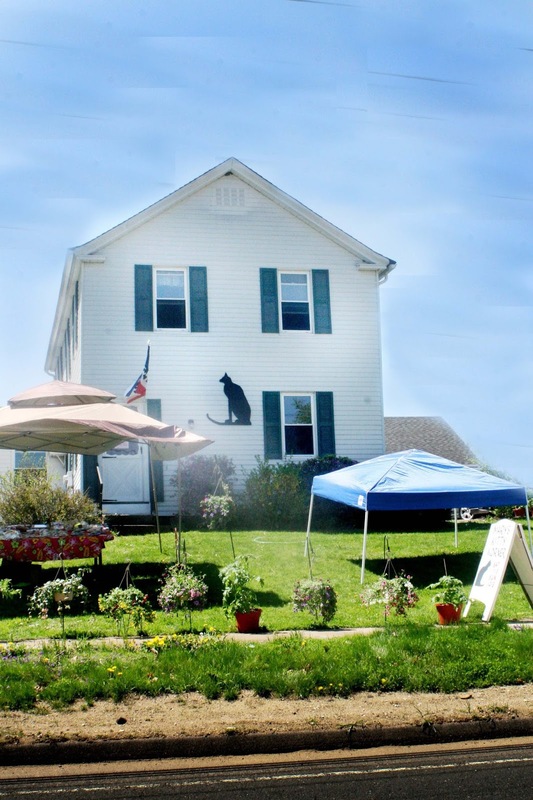 Our Life in New York and "the shelter"
We weren't always so lucky. We had two OTHER humans in New York City before during the first year of our life. We thought they loved us. We became loving & sweet-natured animals, very demonstrative. THEN ONE DAY they put in cages & took to a cold depressing building, They said it was for our own good cuz they were moving to Puerto Rico. Maybe they thought since we had gorgeous ginger and black coloring and fabulous stripes we'd get adopted right away. But no one came to get us and day after day went by. 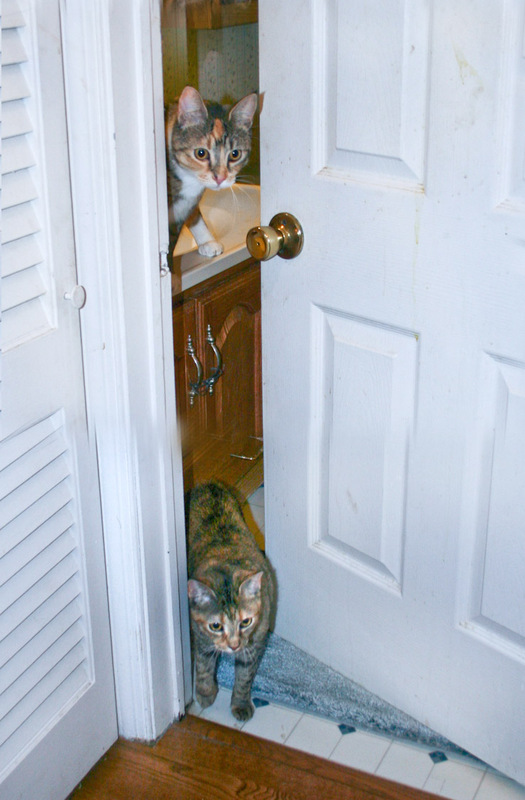 My terrified sister Paprika caught the sniffles while we were waiting. We were beside ourselves with grief and terror. Finally the shelter (called NYACC) decided we were "unadoptable" and put us on a list called "Death Row" - a list naming all cats to be killed the next morning. Here starts the good part of our story. 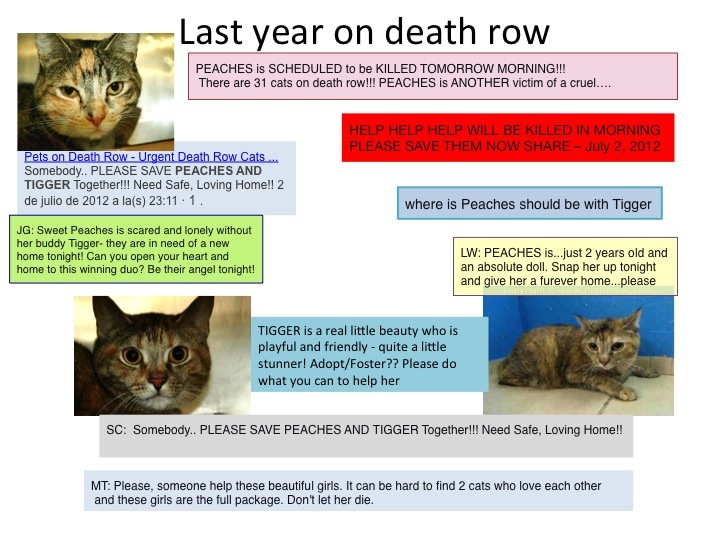 Hundreds of concerned humans watch this "Death Row List on Facebook. They share pictures of cats who win their hearts, they donate funds and they share our pictures. Here are some of the things loving & kind people posted which led to our rescue. We were lucky and captured the hearts of many! 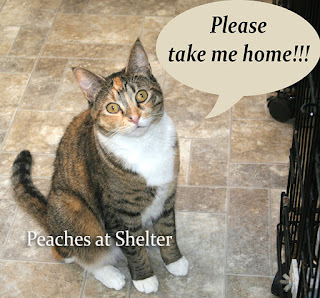 After a brief time (which didn't feel short to us) we were "pulled" from our near fate by a devoted rescue organization. big white house in Connecituct. There were about 40 other cats but we were allowed to roam free and hang out near sunny windows while waiting for our forever homes. Then we met our human, Carol. She fell in love with me on the internet after seeing my picture. "I must have that cat!" she thought... So she found the white house in Granby, Connecticut and met ME. And my sister, of course! I let her pick me up the first day! I don't let just anyone do THAT! 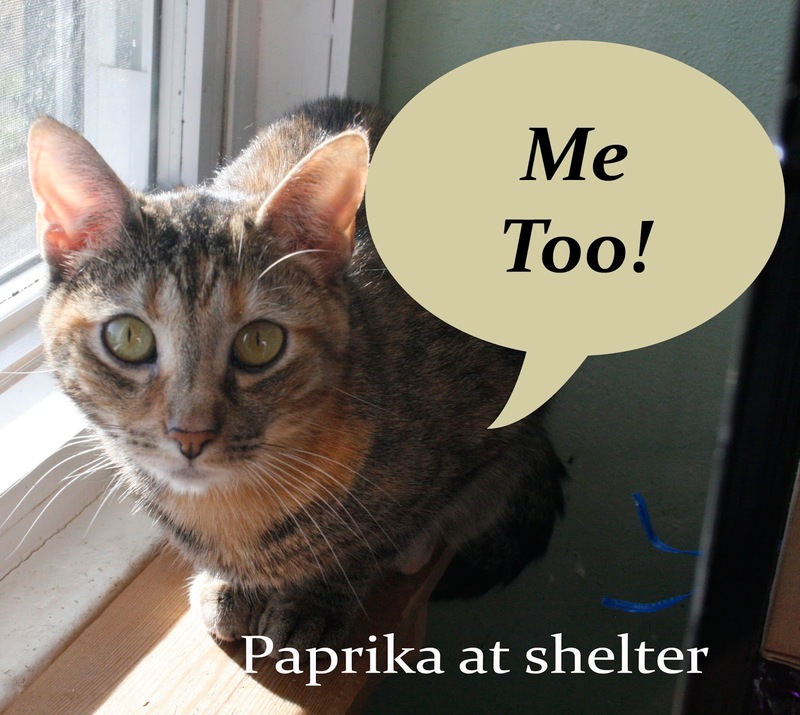 She took both of us home because I would not leave without my sister Paprika (then called Tigger). blogger friends, those wonderful kind humans who shared our story, our foster home where we were nursed back to heath, the kitties still in shelters and the angel kitties who graced our lives for all too short a time! 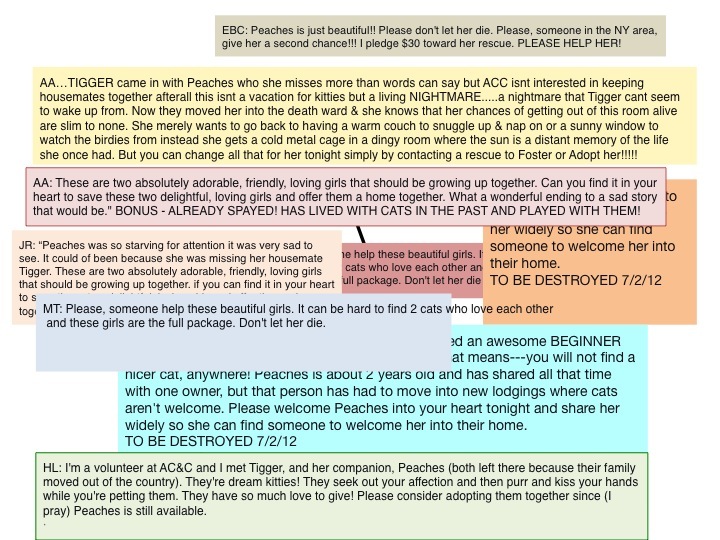 Wow, I had no idea you had such a story, Peaches and Paprika. So glad you found a happy, loving home! My goodness, such a story you tow have and such a wonderful happy ending too. Happy Gotcha Day sweeties! OMC we had no idea you had such a terrible past. We're so happy you found your loving forever home TOGETHER. Happy Gotcha Day!!! Such sweeties, so glad you found your forever home! Happy Gotcha Day to both of you! How scary that you were on death row. But we are glad you were rescued and then found a wonderful forever home! Merlin is celebrating a milestone today - we would be honoured for you to join us. Happy Gotcha Day to you beautiful ladies. I am glad you were able to stay together and got such a lovely forever home. HAPPY GOTCHA DAY GIRLS! So happy you found your forever....so many are not as lucky as you and I........for that and so much more, we are truly blessed! Happy Gotcha Day, girls! We are SO happy that you both got gotted. Happy Gotcha Day, beautiful ladies! Congratulations on your 4th Gotcha Day!!! All those other people passed you by because your guardian angels were working to get your mom to the shelter!! Many happy days ahead. We know the horrors of New York's heartless killing machine. The small foster network we support in the USA is Place for Cats and we love the cats they pull so they have another chance. You two know how lucky you are!! So sorry we're late. Happy Gotchaday. We're so glad you got gotted. And ya'll have a pawsum mommy. Big hugs to all. Hope da day was as purrfect as ya'll are. What a wonderful rescue story! I truly admire people who can follow those kill pages on Facebook. I simply can't do it. I spend all day sobbing at the faces I can't save! But maybe knowing sweeties like you are helped by those pages... I might change my mind. Thank U for reading our story, RS! Thank U for visiting and congrats to Merlin! Wow what story and thank u for sharing it H&H fits! We had no idea you went thru all that for your furrrballs. Thank you on behalf of all fur balls. Yeah it is amazing that anyone could discard US...we still can't believe it. Thank you again for commenting and reading it. Thank U, Angel Sammy. That means a lot coming from you! Thank U, Swiss Cats for reading our story. We like it very much here in Connecticut!! Thank you we sure appreciate that! Thank U furr those loving words, and definitely not too late! Mom Carol has actually made "Facebook Friends" with some of the peoples whose shadings and posts saved us! And she has met our first "foster mom" who rescued us from the NYACC before she met us! Thank u for reading our story! tis amazing to us too. We are so glad those peoples fell in love with us. Our human was aghast when she read our story and wrote to some of the peoples to thank them and now she has about 6 or 8 Facebook friends who were the main peoples who saved us! Belatedly, thank u for reading our story. 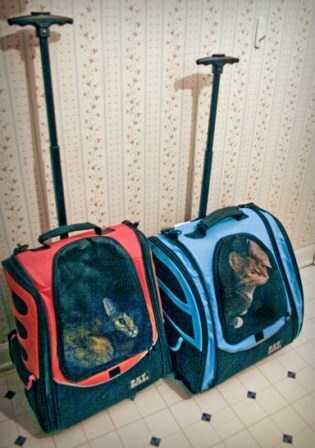 Our original owners went to Puerto Rico according to the NYACC records which our human read. 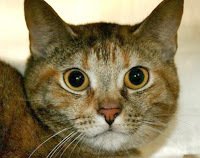 She read all about NYACC & even met in person our first "foster mum" who helped us get over the "shuttler colds." Thank you, DK, for supporting that rescue group you wrote about! Thank U, Pilch and we are lucky to have friends like you! Hah! Got Gotted. We like that. Thank U furr reading our story, dear katz on the island! Belately, Thank U, we hope to be in it one day! Have a great rest of the week and thank you for taking the time to read of our narrow escape! It makes our furs stand on end to think of it! But we are glad to be where we are now.